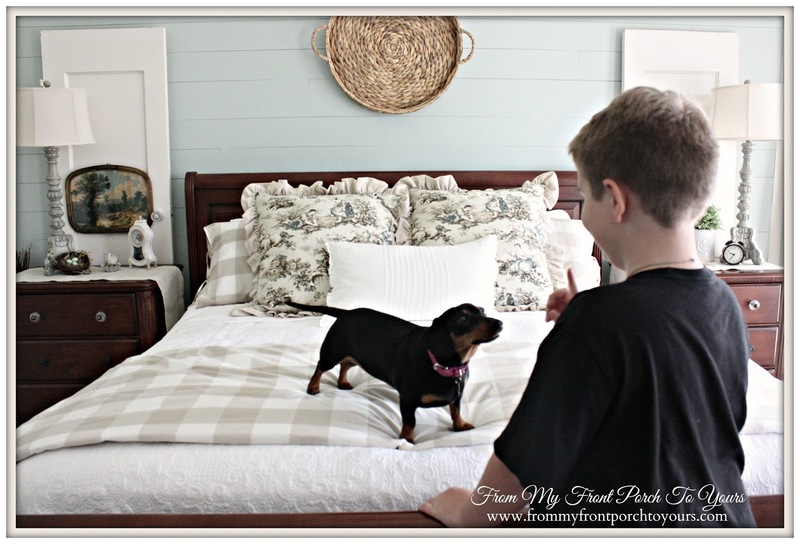 Back in June I revealed our French Farmhouse Bedroom Makeover. If you missed it you can click here and here. Since then I have received many emails about where I purchased certain things so I thought that I would share all that information in one place. 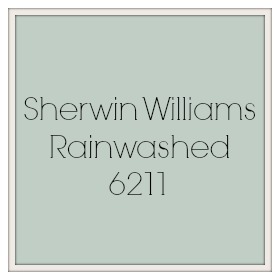 Our room is painted in SW Rainwashed 6211. I have to say I am even more in love with this color than I was when we first painted the space. 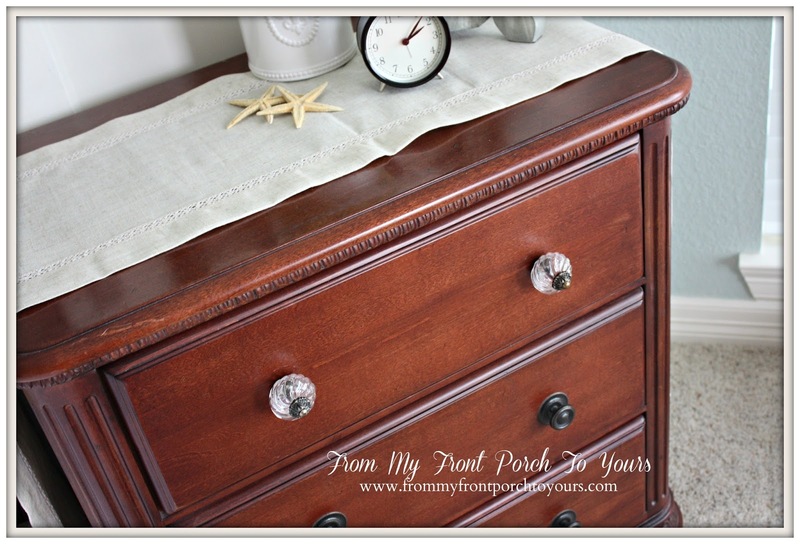 The toile that I used to have custom shams made is called Bosporus Flax by Covington. You may be able to find the fabric at HobbyLobby. 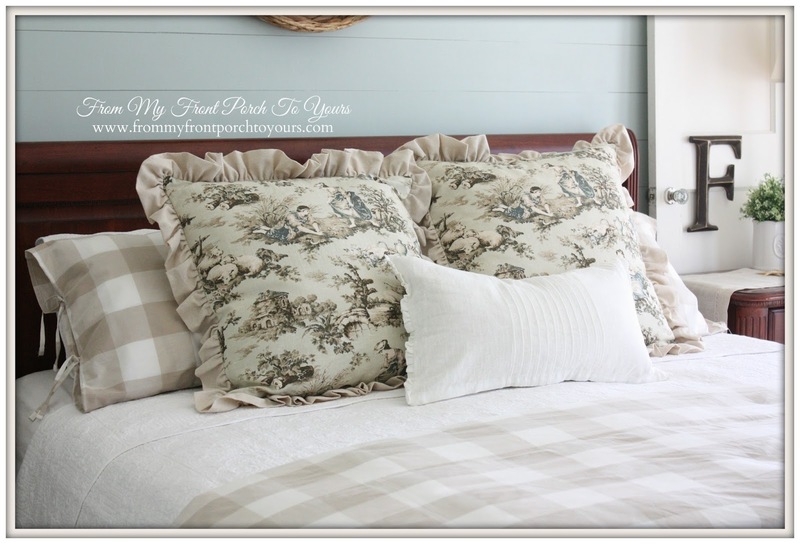 The Buffalo Check Bedding and small linen pillow came from Ikea. 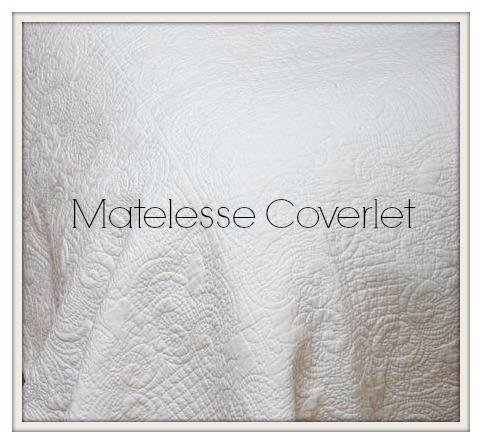 Our matelesse coverlet I found on Ebay at this shop. 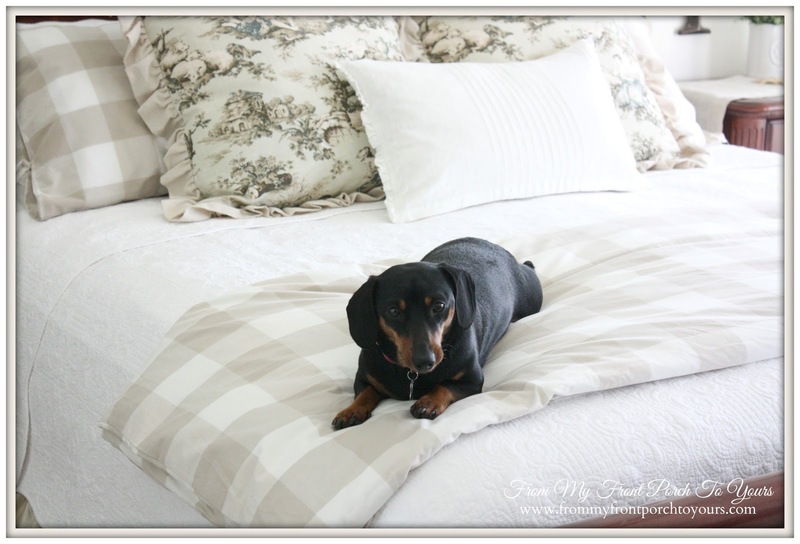 It is the softest coverlet ever! 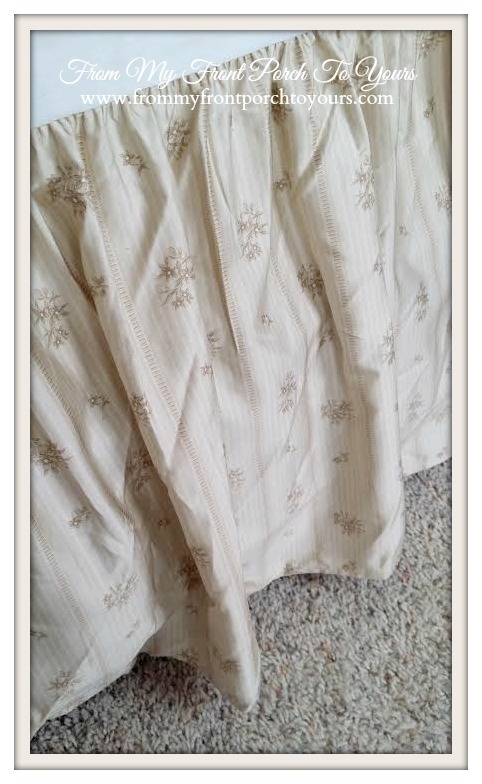 Our bedskirt I won at auction over on Ebay. It is from the Ralph Lauren Villanchy Collection. 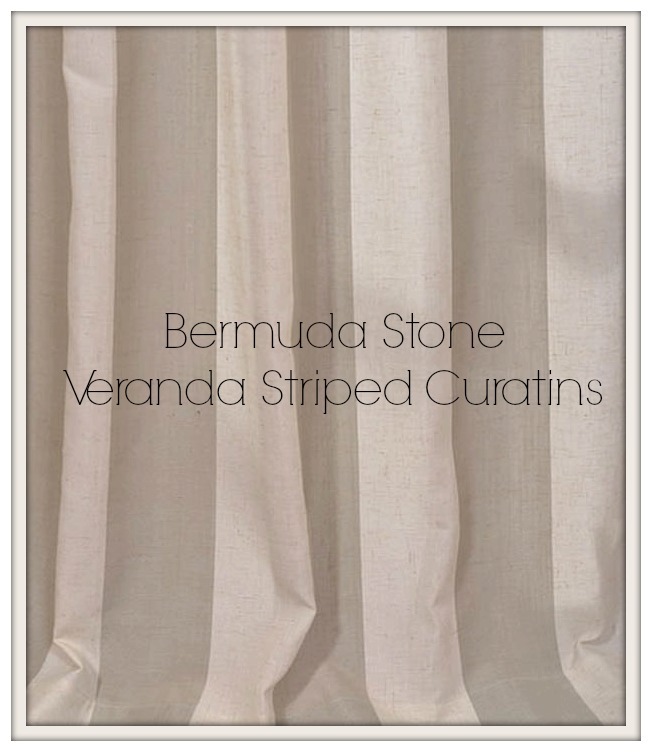 Oh how I love our veranda striped curtains! 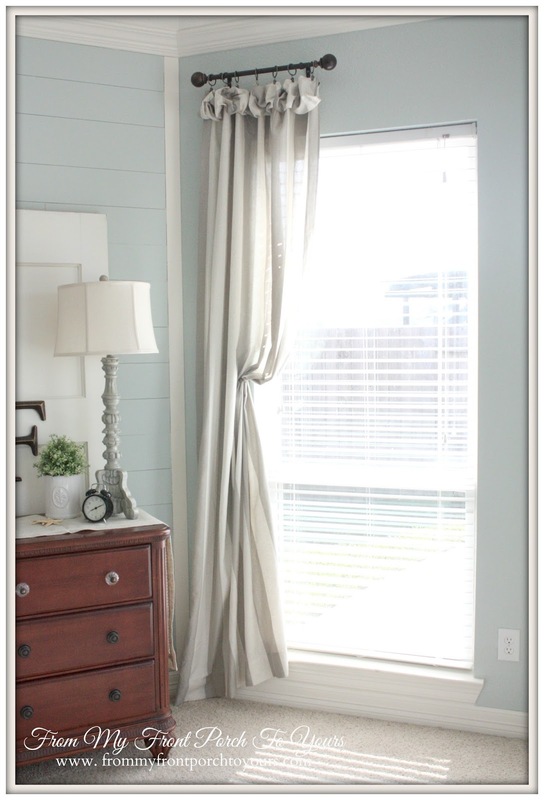 These I purchased on sale at Half Priced Drapes. You can get amazing deals from them. These panels are 120 inches long. They were buy one get one free at the time and I paid something like $42 a panel. I highly recommend you taking a look over there. The lamps I purchased for this space came from HomeGoods. Other accessory items were collected over time. The pasturial vintage cow picture came from a wonderful antique shop in downtown Braselton, Ga called Countryside Antiques. 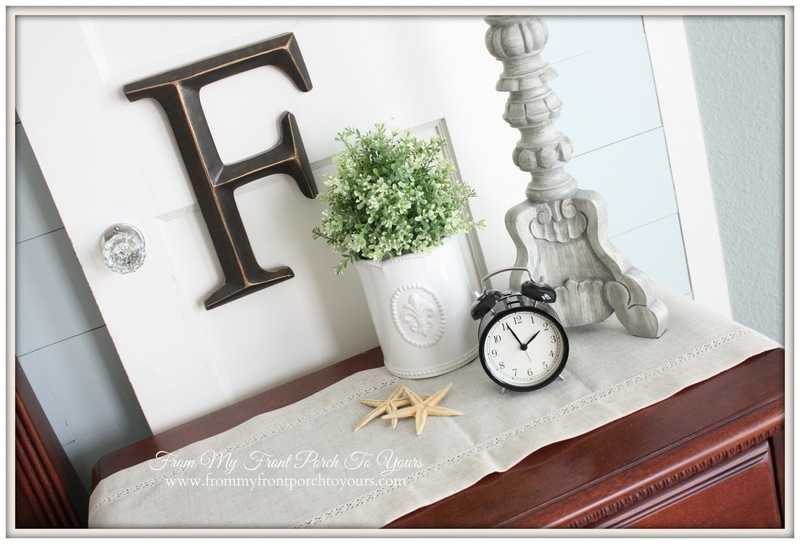 The initial 'F' came from HobyLobby and the little black clock from Ikea. New glass knobs for the nightstands are from HobbyLobby. The large oval basket above our bed is from Target. Our chair I purchased off of Overstock.com. I have also seen it over on Wayfair. The basket that I customized came from HomeGoods. 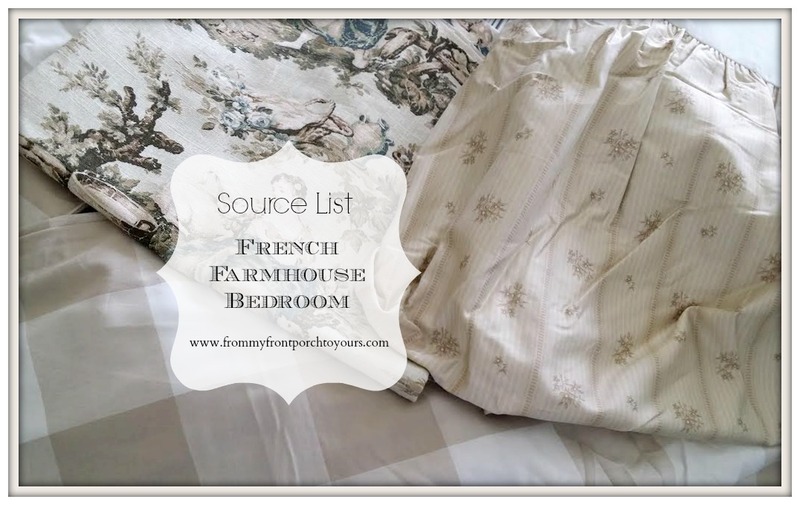 So there ya have it, all the elements of our French Farmhouse Bedroom. It truly is still one of my most favorite rooms in our home. Before I sign off I wanted to share a little behind the scenes action here at From My Front Porch To Yours. Actually I guess it could be called a blooper. You know how you always see beautiful pictures in magazines and books of spaces featuring pets? Well Oldest and I got the idea to attempt this with our Savannah. Thanx for stopping by to visit. 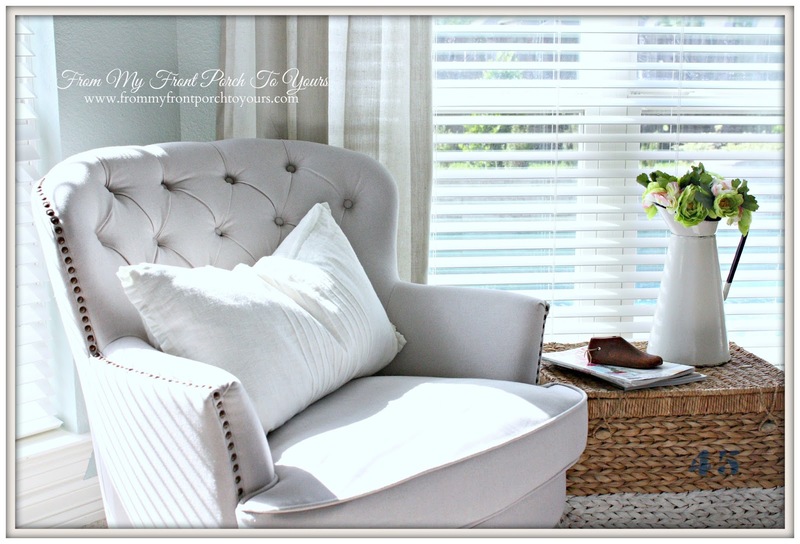 THanks for sharing your sources for this gorgeous room Pamela! I just love this room! 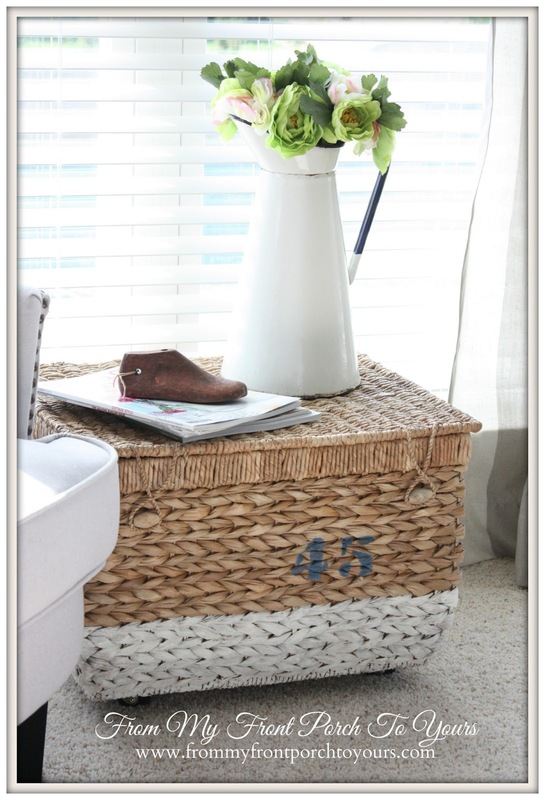 I love the way you customized that Home Good basket as well. I just love this room and I enjoyed seeing it again. 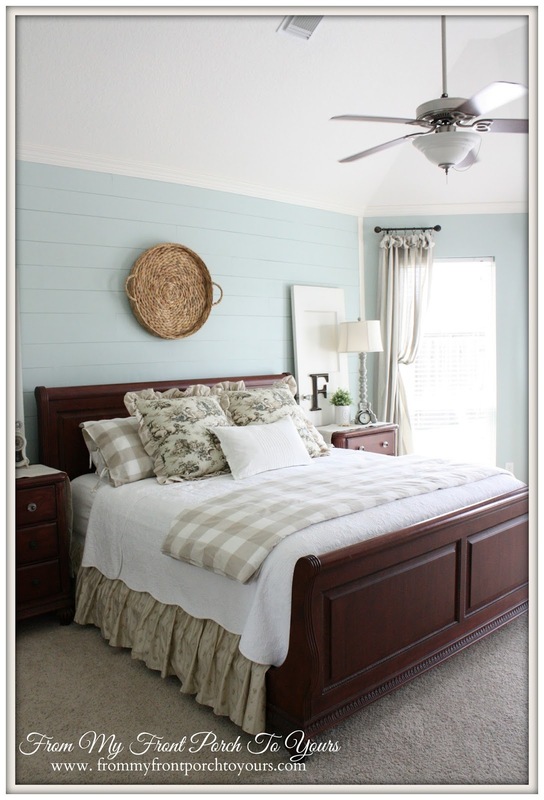 I am redoing our bedroom too but the blue is on my bed and the mocha color is on the walls. Hopefully it will be done in a few weeks. I understand your fustration with trying to get shots with pets in them. I try to have at least one of my dogs in each post but they seldom cooperate. 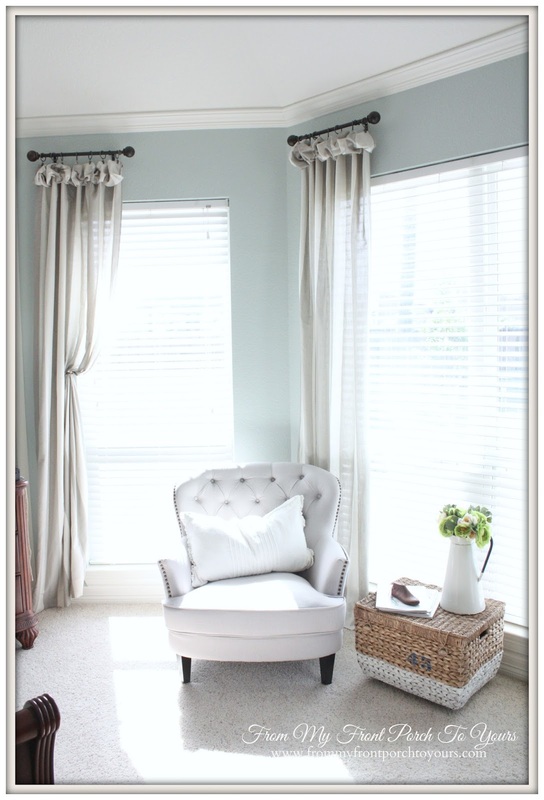 Thanks Pamela for sharing where all your goodies came from....gotta go check out that window treatment site. 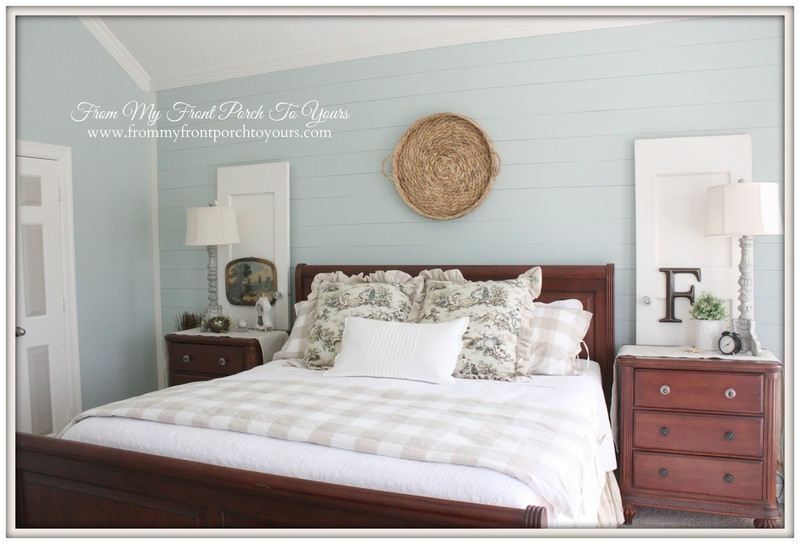 Love your bedroom so much!!! Such a lovely, warm and inviting room. 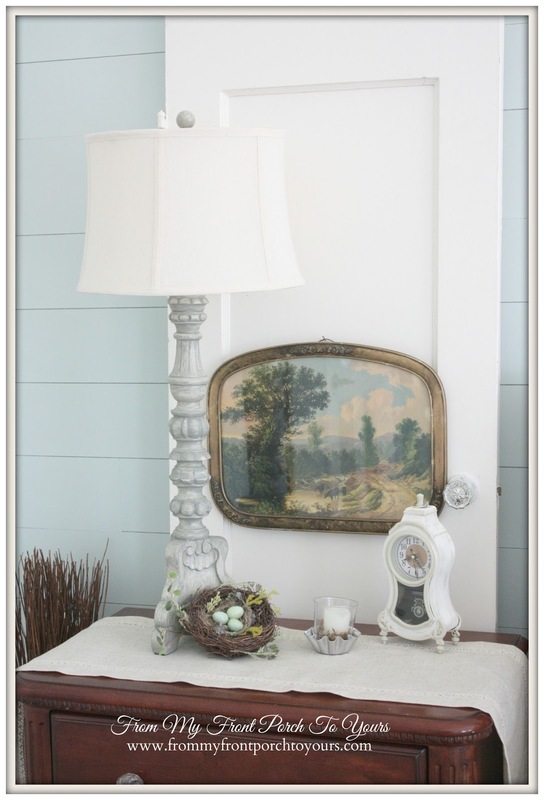 I like the Bosphorus toile in every color way I've seen and I just adore the cow print over the dresser. It's beautiful and in a great frame! It is a gorgeous color. I love the planked wall. The bedskirt is adorable.